Why Is My Smoke Tree Dying? 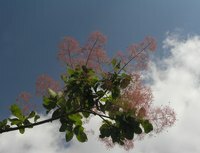 The smoke tree (Cotinus coggygria), a small ornamental tree, often suffers from Verticillium wilt, a fungal disease caused from the fungi Verticillium albo-atrum or Verticillium dahliae. Considered a susceptible tree, the smoke tree may die in a single season. Other diseases, such as stem canker and leaf or rust spot, can occur on the tree but are rarely fatal. Verticillium wilt spreads internally through the smoke tree. The tree begins to yellow during mid-summer. Branches begin to show wilting and die. The top canopy of the tree may be the first area to show death. No cure exists for Verticillium wilt. Try to maintain the tree's health with regular watering and fertilizing to sustain its life for as long as possible. Prune away infected branches and dispose of them. Infected branches that are pruned away may show discoloration in the sapwood. Remove the smoke tree when it dies and dispose of its remains. The fungi will continue to live in the soil so do not plant another smoke tree in the same spot. Choose a tree variety that has resistance to Verticillium wilt. Maintain a healthy smoke tree through fertilizer applications to prevent stem canker. Do not allow the trees root system to become overly water-logged. Apply fungicides to help control foliage disorders such as rust or leaf spots.